Notification via SMS ensures efficient transmission of information and your customers will be informed faster, especially those who do not have permanent access to the internet and e-mails. 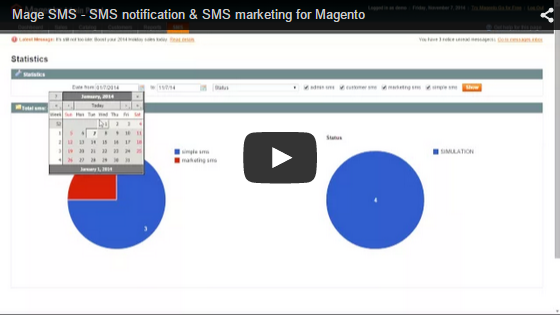 Send text messages to customers or administrators during various events in your Magento store. System also automatically recognizes your custom order statuses! Sending bulk SMS from a CSV file. Simulation mode allows you to test SMS sending during various events in Magento without actually sending them to recipients. SMS are displayed in SMS history with a special status. Automatic conversion of customerÂ´s mobile number to an international format. Credit account management directly from the module (credit account state, low credit alert setting, credit purchase via credit card, bank transfer, PayPal or Skrill). Automatic update of SMS price list with information in which countries were changed price of SMS. API for connecting an external application to Mage SMS module (see file api.php in module folder). We have added also three examples of testing scripts (see files api_test.php; api_test2.php; api_test3.php). This is support topic for Mage SMS module, if you have any questions or experience any problem with Mage SMS module please don´t hesitate to write it here. We will help you as soon as possible.